I am a traveler now, sitting somewhere in a corner of the world, a grown man. As I attempt to commit my memories to paper, it becomes increasingly difficult to connect the bits and pieces of my life that seem to have dispersed over time. On the wings of relativity, I try to find the words that can carry me from that far away place where, years ago, I began my journey in this world. Conjuring memories from images is not as easy as it seems, memories and images do not follow a logical trajectory, because the image is untethered from nature. The image often escapes our grasp and becomes smudged by the fingers that try to pin it down. Yet, Teta Xhano remains in my memory. A beautiful butterfly. Flickering like a filmed image that this director has left among us. From the age of five years old, I started to view life through the lens of cinema. I have lost this capacity over the years, but I have not yet lost the sensations and sounds of that world that I can still hear and feel within me. After more than three decades, the moment that I can still recall with immediacy is the moment when Xhanfise Keko knocked on the doors of the elementary school "Constantine Alexander" in the city of Berat in search of the last character that would complement the ensemble cast of young actors she had hand-picked for the film Tomka and His Friends. She was looking for someone to play the character Guri, the brother of the character Çelo, for which Artan Puto had already been cast. Thus, by the fate of my physiognomy, I was a possible candidate. However, it was determined that my participation in this film would require a screen test despite the fact that I seemingly had the right look. 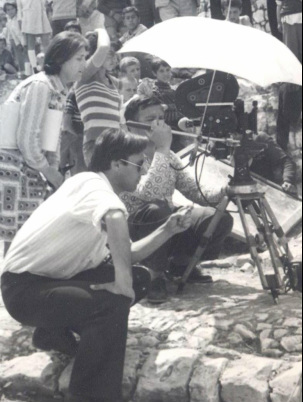 I recall that it was the hottest part of the summer in Berat when filming began on Tomka. In the original script my character Guri was a relatively minor character in relation to the bigger roles played by Enea Zheku, Herion Mustafaraj, Genci Mosho, Artan Puto, and Selma Sotillari. I also remember that, being by nature a child with an overactive imagination, I started to improvise on the first day of shooting, probably unconsciously. Thankfully, Teta Xhano’s watchful eye that observed and coaxed every tone, every action and every word and gesture of ours before the camera, did not inhibit my actions and gestures that day. She understood that children are prone to spontaneity, and instead of getting angry at me for going with my gut, she encouraged me to fill the character with as much detail that I, Flurans, imagined to be true to Guri. So, day after day until the end of filming in Berat Teta Xhano made space in the shooting schedule and in the script for me to develop Guri, who, in the finished film, is a quite memorable and charming character. I remember distinctly one of those extra hot days when the scene we were shooting was a long and tedious one. We were shooting down by the riverbank, one of the most breathtaking spots for me ... Guri is lagging behind with his goat in the corner of the field where the other children are playing, when suddenly, the dog Luli rushes to get the ball. Shy little Guri starts to cry " … LLL…Luli is attacking my goat!" All those who have seen the movie remember this scene because it seemed so natural and unrehearsed. But it wasn’t easy to achieve that. Little Flurans, then just five years old and the youngest of the troupe, did not want to act the part of the baby and cry. I can’t remember exactly how I was resisting, but I was being extremely stubborn, “No! No! Why should I cry ? Come on, tell me Teta Xhano, why should I cry?” I asked over and over after countless explanations as to why Guri needed to cry. One of the crew rightly lost his temper with me in that July heat. Then, when all attempts to persuade me had been in vain and the shooting of the scene was stalled because of my tantrum, Teta Xhano turned to me and looked at me with a look that I had never seen in her eyes. What was that look? Indifference? Punishment? Teta Xhano was always so loving with us. “You will not cry?” she asked me sternly. “No , why should I cry?” I replied stubbornly. Then she turned away with indifference and addressed the group shouting at the top of her voice, “Fluransi will not cry, so gather all the cameras and lights! Today we will not shoot! Tomorrow we will find another boy for the role of Guri! I tried to get someone to look at me, but it was useless. No one would look at me. They all went about their business, and no one would speak to me. More than being ignored by the others, I suddenly felt empty and upset with myself. With my eyes on the goat tied behind the trees, two involuntary tears started to stream down my cheeks, all of a sudden the warm tears were running down my face. Two tears were followed by two more and suddenly I began to sob with my hands around the goat’s neck. The goat was now my only companion. The only consolation at that moment while I wept was the voice that said, “Motor!” Suddenly, I realized it was the voice of Teta Xhano and I looked to see her hand raised high, signaling for the cameras to roll. Then the lights were on and I gave the camera all the tears I had. I looked up and saw her face through my tears, the woman who had just abandoned me moments earlier, who had turned away from me completely, gave me the cue to go on crying. And I, little Fluransi, all excited and getting into the character of Guri, saw that Teta Xhano’s eyes had also filled with tears. My two souls merged into a single body, and began to draw out naturally and loudly the voice of the character, as if he was I, and I was he. When I heard the word "Stop!,” my eyes instinctively turned from the camera and then I saw her again, in the same place and as the same woman who was everything to me. I felt that Teta Xhano’s eyes were back to their usual sweetness. After nearly eleven years of being away, in December 2005, I returned home to Albania as an artist. Often my colleagues and my readers have pointed out to me a key characteristic of my art. Within my prose it was as if the filmic image had been translated into words. I used words now to conjure images for my readers. On the cover of my book "The Soles of Memory" there is a picture of the character of Guri. Perhaps I did this because in those days I was full of nostalgia for my country. I wrote an article titled “Whose Homeland are you?” It was a way to reconcile the feelings of seeing the world through the eyes of a child. It was a sort of letter or cry to my homeland, my city, my river, and my migration away from Albania: expatriated pain. Of course, my experience as an actor in Tomka and His Friends was also part of this story. Xhanfise Keko obviously had her undisputed place in the text and in my memory. During this visit to Tirana, a journalist with the magazine "One" was invited to a meeting organized by the former child actors from Tomka, Genci Mosho, Enea Zheku and Artan Puto. It was exciting to reconnect after nearly thirty years with my early film friends. Only Herion was missing, and it had been many years since we had seen each other, but we had spoken on the phone once during my years in New York, where Herion also lived. However, the greatest pleasure that day was meeting again with Teta Xhano. To drink a coffee with this woman whom we all loved so dearly. This noble woman whose face had not lost any of its freshness and charm, even in her golden years! It was a privilege to work with Teta Xhano: Artist. Albanian. Thanks to her artistic intuition she knew better than any of her colleagues how to open the gate to the magical world of children, and what makes original, unique and enjoyable films for and about children, that stand the test of time. Two years later, on December 23, 2007, we met for the last time. This time, just as I never wanted to imagine. I remember well that Sunday, so sunny and warm, a rare winter’s day, when we accompanied Teta Xhano to her final resting place. Hundreds of creative collaborators, children, friends, that for more than two hours gathered in silence. Surrounded by garlands of flowers, we gathered together in Tirana in the hall of the National Museum, for a final farewell, and to give thanks. I am sure, in this moment, deep in the enormous expanses of our memories, conjoined that day for Teta Xhano: pieces of lives, pieces of art pieces of words, fragments of films, fragments of feelings, we sensed that vital force that makes us feel part of a life that is bigger than us alone. Translated and abridged from his chapter in the memorial book Teta Xhano. Flurans Ilia was born in Berat, Albania. He went on to study at the Aviron Institut Technique de Montreal, Canada, where he currently resides. He works in the technology industry, and also writes and publishes poetry and prose.